Marciano della Chiana is a small village of medieval settlement, located on the border between the provinces of Arezzo and Siena, in the heart of the ValdiChiana. 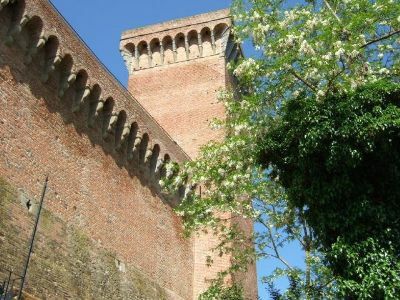 Differently from the neighboring villages, mainly residential, Marciano with its Castle presents a military-defense architecture. The Castle’s Fortress is dominated by an imposing tower, which served as a watchtower. In fact, the territory of Marciano thanks to its strategic position, was long disputed between the domains of Florence and Siena. In particular we remember the historic "Battle of Scannagallo" of August 2, 1554, also known as the "Battle of Marciano", which was frescoed by Giorgio Vasari in the Palazzo Vecchio in Florence, and anticipated the conquest of the hegemony in the Tuscany region by the Medici. Today the Tower has been completely restored and is open to the public, and after climbing a series of stairs you will be rewarded by an astonishing panorama that spans 360°. Inside the Fortress was created a multi-functional center where you can see a model of the Battle of Scannagallo, with tin and lead soldiers hand painted and 25mm high. In addition inside the Castle are exposed costumes and armors of the period with explanation panels to guide visitors as in a museum. You can visit the Tower of Marciano from March to October on weekends, while during the months of July and August it is open daily. For a cheap ticket of € 3 you can enter and discover the medieval history of Tuscany. Reduced ticket for EuroCasa Holiday customers who wish to visit the Tower of Marciano. If you are thinking to spend your Holiday in this area we propose Villas and Holiday homes at Marciano della Chiana.